This year I actually got around to joining in with the RSPB Birdwatch. Out in the garden with a cup of tea and a notepad to record what birds are out there. I don’t feed the birds in the garden, with two cats it seems a bit unfair to lure them in, but I do put food out on the extension roof, the birds can get at it but the cats can’t get the birds and it doesn’t encourage rats – a win-win all round. Weirdly it also means I can sit in the bath and watch the birds coming and going! Anyway while I was out there I started going through what I am going to plant this year and wondering what wildlife I will have visiting me. We have the allotment for growing food so the garden is for playing in which means it doesn’t have to be too ordered and I like the fact that in this small garden I can make a small wood pile for the stag beetles which I seem to have a few of every year. The little pond has newts and various snails, water beetles, fresh water shrimpy things and in the summer it throws up damsel flies and dragon flies. There are LOTS of slow worms which I love and the occasional hedgehog. I would like more and have built a hedgehog house which hasn’t been used yet, maybe one winter they will more in. Sadly the last hedgehog we had was eaten by an invading badger. We do get butterflies although I’m not very good at identifying them and bees and I look out especially for the honeysuckle hawk moths in late summer that visit the honeysuckle outside the back door. So I’m looking forward to a wild summer in the garden and planting according which luckily means lots of flowers to attract the insects. 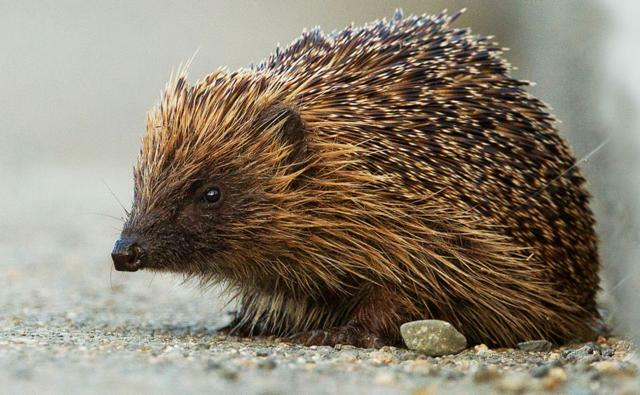 As I write this it is Hedgehog Day, hopefully that is an omen and I will get the hedgehogs visiting the garden this year. This entry was posted in Uncategorized by Rita. Bookmark the permalink. Thank you – sounds neater than it looks!